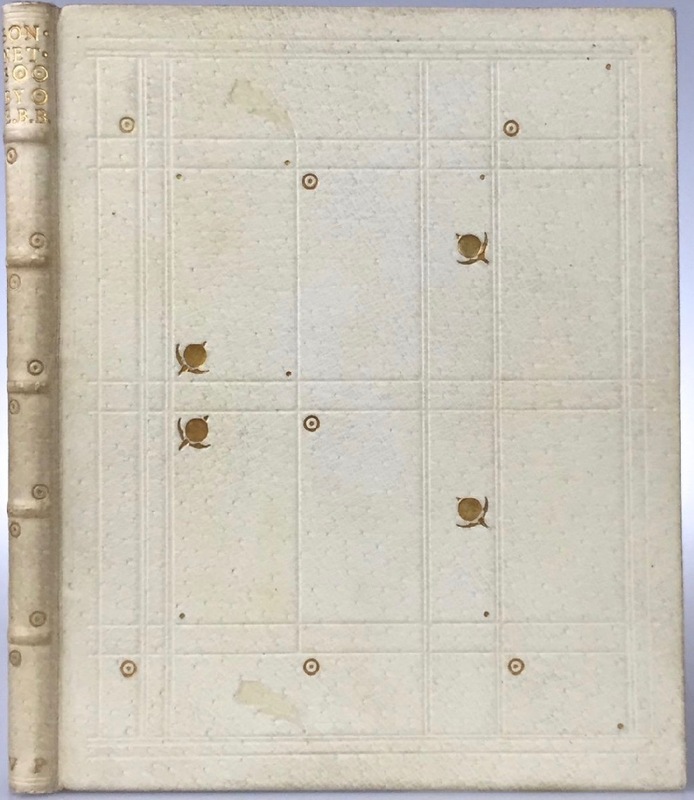 In an earlier blog about the Hodson sales, we established that there were at least two copies of the Vale Press edition of Elizabeth Barrett Browning's Sonnets from the Portuguese that were specially but identically bound in pigskin. Both copies were printed on paper and bound in white pigskin after a design by Ricketts. To quote blog 121: 'There is a geometric panel on the covers, with small flowers and roundels tooled in blind and gilt'. One copy, however, bears the initials HR of the publishers Hacon and Ricketts on the inside of the lower cover. The other copy did not. A third copy is on the market now. 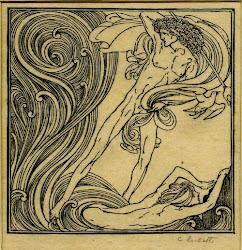 Nudelman Rare Books offers it for sale, most recently in Catalogue Thirty-Six (issued just now). The third copy is unsigned. It had been offered for sale earlier in 2011 by Thomas G. Boss, as Nudelman notes in his description. This binding underlines, once again, that these bindings in white pigskin are designed exclusively for paper copies of Vale Press books. Vellum copies have been bound in leather in several colours (red and green for example). Ricketts used some sort of colour system to differentiate between deluxe and ordinary copies of his books, even if luxury bindings were commissioned for them. We have to remember that the paper copies of this book were issued in a blue paper binding. All other bindings for these paper copies were private initiatives. 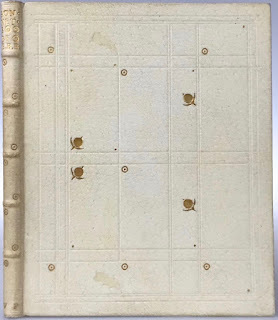 Now we know, that at least three collectors at the time asked Ricketts to design a binding for such an ordinary copy (there were eight copies on vellum). For vellum copies Ricketts designed a one-off binding; but paper copies had to do with one design for multiple copies. Still, a wonderful design, although the spine of the third copy is somewhat browned. The front cover is as white as that of the Hodson copy. The second copy seems to have been bound in a more cream-coloured pigskin. Personally, I find these identical copies - with their small differences - far more interesting and revealing than the unique designs for vellum copies. They tell an untold story about the marketing strategy of Vale Press books.